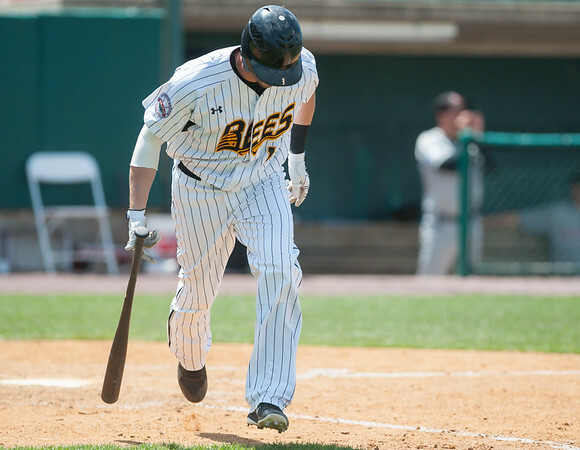 NEW BRITAIN - The New Britain Bees entered Wednesday’s doubleheader against the Lancaster Barnstormers with the second-worst batting average in the Atlantic League. By the end of the afternoon, it didn’t get much better. The Bees managed a combined 12 hits as they dropped both games of their doubleheader to erase a two-game winning streak. New Britain lost the first game 4-2 and didn’t get on the board until the seventh a final inning. Down 4-0, Manny Ramirez Jr. and Dee Ford hit back-to-back RBI singles to produce the team’s only runs of the afternoon. Rainy Lara (0-2) was the Bees starter. He went six innings, giving up four earned runs on seven hits. Lara also struck out three and walked one. The second game proved to be even more difficult offensively. New Britain collected a mere four hits in the 2-0 loss, wasting a solid outing from starter Andy Van Hekken (0-3), who allowed one run over six innings of work. The Barnstormers scored their first run in the third on an error by Deibinson Romero and against in the seventh off Tyler Higgins after Matt Hibbert was able to reach first on a fielder’s choice. Posted in New Britain Herald, New Britain Bees on Wednesday, 16 May 2018 16:59. Updated: Wednesday, 16 May 2018 17:01.